If your are driving the motorbike a motorcycle jacket is essential. A women's motorcycle jacket must firstly provide protection. Preferably, the ladies' motorcycle jacket should look nice too. In our collection we offer different styles of various brands. A good motorcycle jacket is essential when you ride a motorcycle. It provides protection and safety, must be comfortable, but also fits you. 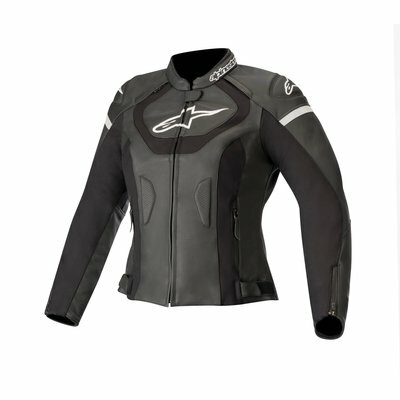 The choice for a women's motorcycle jacket is therefore a personal one. It has everything to do with the way you use your motorbike. We offer a wide collection of women's motorcycle gear and every lady can find a nice and safe motorcycle jacket for women in our shop or webshop. With the information below we want to advise you when buying a ladies motorcycle jacket. Do you have any questions or would you like to receive expert advice from one of our specialists? Then you can always contact our customer service. Which type of women's motorcycle jacket fits you? 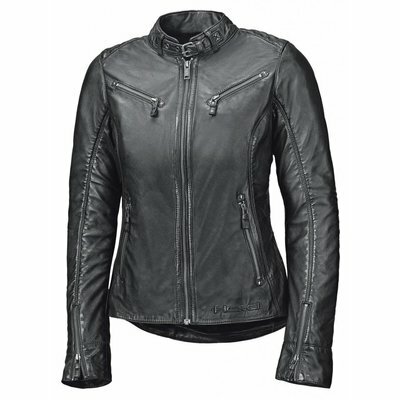 Biker Outfit has a very diverse range of women's motorcycle jackets in collection. 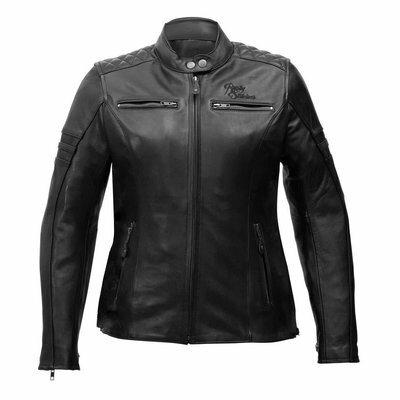 For example, we have leather motorcycle jackets for ladies that are very classic eyes and made of thick leather. 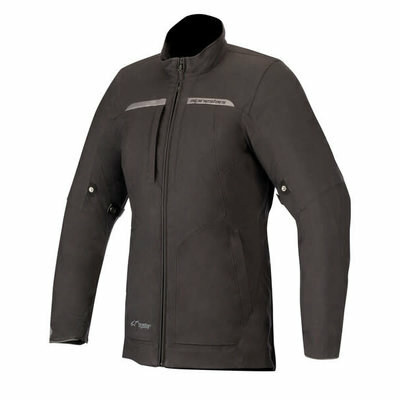 We also sell ladies Gore-Tex motorcycle jackets. So both the sporty driver and tour rider can find a suitable motorcycle jacket for women. If you make the choice for a jacket, you should not only look at the type of material. 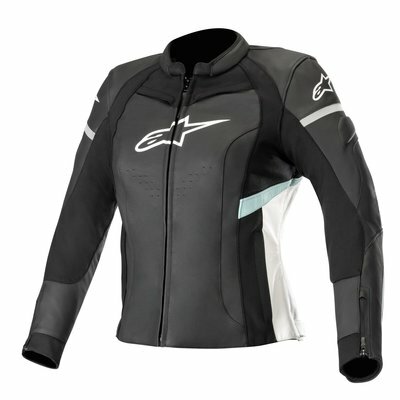 Buying a women's motorcycle jacket also has everything to do with the use of the motorbike. Are you a sporty driver, a tour driver or do you use your motorcycle for daily use, for example to work? 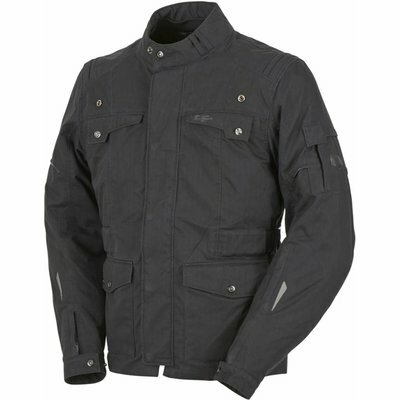 The choice of the length and the material of the jacket depends on the use of the motorbike. If you are a sporty driver, we advise you to take a short jacket. In a sporting attitude, a long coat is not good. If you are a tour rider or you use your motorcycle for daily use, a long coat is recommended. A long coat covers your back completely. We also recommend a wind and watertight variant for optimal comfort. Our motorcycle jackets come in many models and variants. For the winter we also have wind and waterproof jackets that ensure optimal comfort. With every season of the year you can go to Biker Outfit for another coat. As each of us has a winter coat and a summer coat in the closet, it is nice to have at least two coats for motorcycle riding. All season motorcycle jackets are an easy purchase, but for the motorcyclist who drives every day may not be enough. 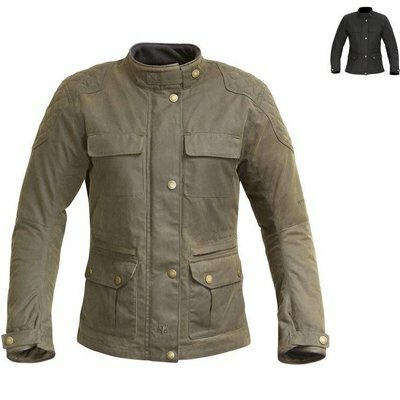 It is therefore not strange that we sell motorcycle jackets for the spring, autumn, summer and winter. A warm textile motorcycle jacket is great in winter, while a leather-through motorcycle jacket might be preferable at high temperatures. 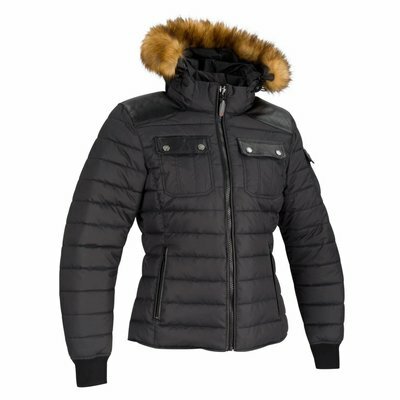 The choice for a particular motorcycle jacket for women comes down to the design, the qualities and the material of this particular jacket. With the motorcycle jackets for ladies you can choose from coats of leather, hardwearing denim and textile. Kevlar is a hardwearing fabric, often combined with denim fabric. Motorcycle jackets in Kevlar therefore look like jeans jackets, but they do protect a lot better than that. 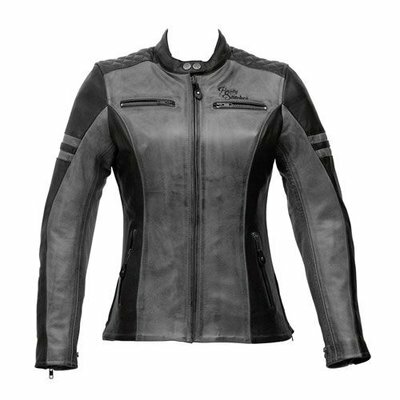 A textile ladies motorcycle jacket is a lot smoother than a leather motorcycle jacket. Textiles also give you more room to move and you can still wear your own casual clothing under the jacket. This is therefore useful for people who drive to work every day. 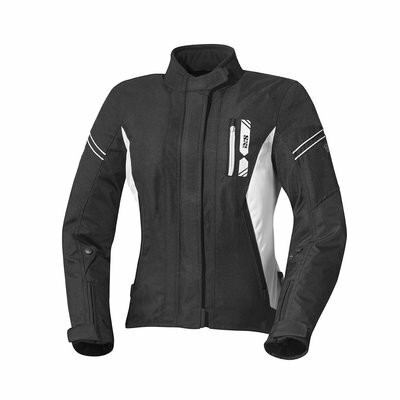 Textile women's motorcycle jackets are breathable, waterproof and provide ventilation. A textile motorcycle jacket can easily be machine-washed. A leather ladies motorcycle jacket will soon be around your body and you will have less room to move. This is safer, because the material is so close to your skin, that there is almost no movement in a possible fall. Because of this, it can hardly rupture. Leather is very strong and wear-resistant material. 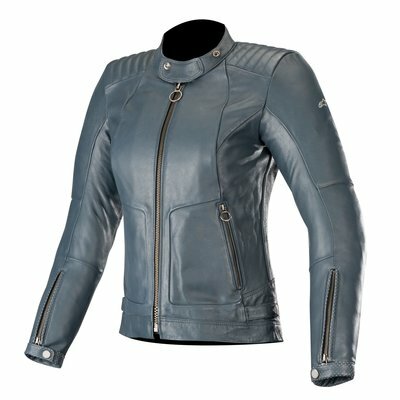 Leather motorcycle jackets for women are mostly worn in motor sport. 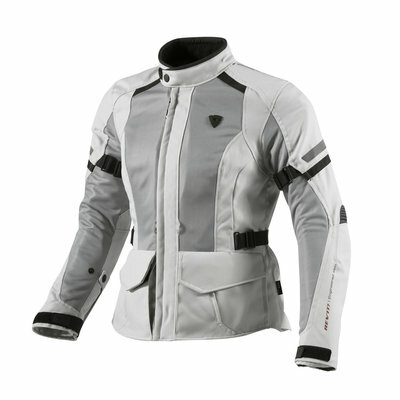 The above material provides safety for women's motorcycle jackets. If you are a sports driver, it is also important to protect the shoulders and elbows properly. Here are jackets with special protectors for. In some cases it is also advisable to wear a back protector and breast protectors under your motorcycle jacket. 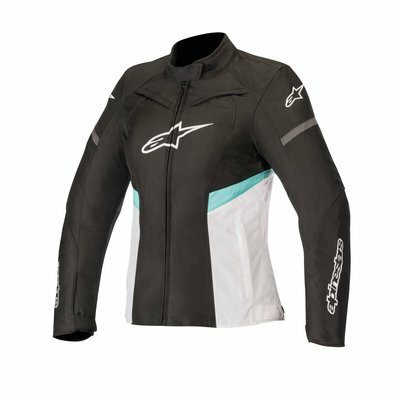 Are you looking for the perfect women's motorcycle jacket but you have questions? Please contact our customer service. Our motor specialists can help you with the purchase of your new ladies motorcycle jacket. We would be happy to advise you which jacket is the best purchase in your case, after which you can make rides for years with your motorcycle jacket. You can order women's motorcycle gear easily and quickly. With an order from € 50, - you benefit from free shipping in the Netherlands.